Le Département d'informatique et de recherche opérationnelle de l'Université de Montréal est heureux de vous inviter, en association avec le programme de la maîtrise en commerce électronique (Université de Montréal, HÉC Montréal), à son troisième atelier sur la vie privée en commerce électronique. L'objectif de cet atelier est de permettre aux étudiants, chercheurs et praticiens qui sont intéressés par l'intimité numérique d'interagir avec des praticiens et académiciens prestigieux du domaine. L’activité est gratuite mais le nombre de places est limité. Il est donc obligatoire de s’inscrire avant le 30 avril sur http://www.iro.umontreal.ca/~gambsseb/prive07-workshop/inscription.html. The Department of Computer Science of the Université de Montréal, in association with the Masters program in Electronic Commerce (Université de Montréal, HÉC Montréal), is delighted to invite you to its Third Workshop on Computer Privacy in Electronic Commerce. The purpose of this workshop is to allow interested students, researchers and practitioners to interact with prestigious academics and practitioners in the field of computer privacy. The activity is free of charge but the number of seats is limited. It is therefore necessary to register no later than April 30 at http://www.iro.umontreal.ca/~gambsseb/prive07-workshop/registration.html. Identity Theft: Why It Is Not Going Away, How Come Law Enforcement Is Not Working and Could Regulation Provide Better Outcomes? Abstract: As identity theft incidents continue to be reported in the media with an alarming frequency, it should now be clear that vulnerabilities to the integrity of personal data represent a structural feature of the information economy. This talk will be divided in three sections. First, I will discuss the criminogenic characteristics of the internet and what we know about identity theft victims. Then, I will explain why police organizations and the courts are very badly equipped to deal effectively with this problem. Finally, I will offer an alternative based on the principles of nodal governance and responsive regulation. Biography: Benoît Dupont is Professor of Criminology at the Université de Montréal and Deputy Director of the International Centre for Comparative Criminology. He is also the holder of the Canada Research Chair in Security, Identity and Technology. His areas of interest include the governance of security –especially the functioning of security networks–, the impact of new technologies on policing and the impact of mass surveillance on privacy. He recently co-edited a book with Jennifer Wood titled “Democracy, Society and the Governance of Security” (Cambridge University Press, 2006). Abstract: This talk will present a variety of research involved in the development of SPARCLE, an organizational policy management system specifically targeted at the authoring, implementation and monitoring of privacy policies. In our work we consider different types of Privacy policies - from high level principles (e.g., we will protect the privacy of customers data), through sets of rules that govern access to enterprises'personal information on customers (e.g., only doctor with direct responsibility for a patient can access medical test results unless prior consent is given by the patient). Comprehensive, accurate policies are the cornerstone of technologies that implement and enforce privacy. Thus, tools for policymakers to author policies should be highly usable, and should also be effective in helping an organization communicate with people whose data is collected and used. SPARCLE includes a natural-language-based policy authoring system which is designed to make policy authoring easy for privacy officers, and which also facilitates the policy refinement necessary to produce implementable systems. We have conducted several studies in which participants used SPARCLE to author policies. The studies showed some of the strengths of SPARCLE as well as some potential areas for improvement. In additional to describing the natural language parsing in SPARCLE, I will present our research on tools for visualizing policy coverage and for analyzing policy rule redundancies and conflicts which we include in our system along with our early work in connecting policy to enforcement records to provide monitoring and auditing capabilities. Finally, I will briefly describe work in a new Open Collaborative Research project on A Framework for Policy Management for Security and Privacy involving research teams at IBM, Carnegie-Mellon, and Purdue. Biography: John Karat is an internationally recognized researcher in the field of human-computer interaction. Over his career with IBM Development (1982-1987) and Research (1987-2007) he has worked on the development of guidelines and principles for user interface design (including the chairing committees for the development of ANSI and ISO standards), researched and advised on design collaboration, researched and developed speech-based systems (including the design of IBM's large vocabulary desktop speech recognition system), researched and designed electronic medical record systems (for Kaiser Colorado Region and Barnes Hospital in St Louis), and information search and unstructured knowledge management, entertainment applications, personalization. John is currently involved in research on privacy and information system policy management. At IBM Research, he has been a researcher, project leader, and manager. John is currently co-leader of the IBM Privacy Research Institute, senior researcher on a project to enable end-to-end management of privacy policies in natural language, and project leader for an open collaborative research (OCR) initiative in privacy and security policy management with Carnegie Mellon and Purdue Universities. He has been awarded several patents (addressing speech recognition interfaces, and general help systems) and received a number of internal IBM awards for invention achievement and other contributions. Recent publications have been in the areas of speech user interfaces (best paper award at the 1999 IFIP INTERACT conference), personalization (including an edited book "Designing Personalized User Experiences in eCommerce" published by Kluwer), and development of a policy management workbench for privacy (Best paper nominee at ACM SIGCHI 2006). Abstract: Students engaged in online learning risk privacy violations. As with e-commerce systems, personal information must be shared with the system in order to receive quality learning services, but in addition, personal information needs to be shared with teachers and peers to engage in meaningful collaborative learning activities. Since these others tend not to be personally known to the learner, learners face some risk associated with untrustworthy peers or instructors failing to follow privacy policies. Separating one's personal identity information into partial identities, each with their own pseudonym, offers a solution that mitigates many such risks. But managing partial identities has its own challenges, both technical and social, and I will explore these in my talk. Dealing with younger learners adds extra privacy risks and leads to investigation of issues around identity formation for young people in the online era. Biography: Jim Greer is a Professor of Computer Science and Director of the University Learning Centre at the University of Saskatchewan. His research is in the area of artificial intelligence and adaptive, personalized online learning systems. For the past 20 years he has been the Director of the ARIES Laboratory, an internationally renowned research lab in the AI in education community. In his new role with the University Learning Centre, he leads faculty development and learner support activities at the University and leads projects to enhance online learning experiences for all learners and instructors. Abstract: The best defense from hackers is to understand how they think. This presentation will provide valuable insight into how hackers circumvent and defeat security controls in networked environments, applications and operating systems - even within a seemingly secure environment. Topics covered will range from information gathering techniques to the final stages of exploitation. Biography: Mr. Fortin is Vice President of professional services and oversees the security consulting group at GoSecure. Mr. Fortin has more than seven year's experience with voice and data service providers and several private and public sector organizations. Before joining GoSecure, Mr. Fortin worked as director of North American technical services for one of the three largest distributors of advanced networking and telecommunications products worldwide. This experience allowed him to act as a senior consultant and project manager for various Fortune 500 organizations and government departments. Over the years, Mr. Fortin gained such expertise as designing and maintaining successful converged and secure telecommunication infrastructures. Mr. Fortin has a degree in computer science from Université du Québec and many industry certifications relevant to telecommunications and IT security. L'atelier se déroulera à l'Université de Montréal. Les présentations auront lieu dans la salle Z-330 du pavillon Claire McNicoll. Le déjeuner sera offert gratuitement au salon Maurice L'Abbé, qui se situe au 6ième étage du pavillon André-Aisenstadt. 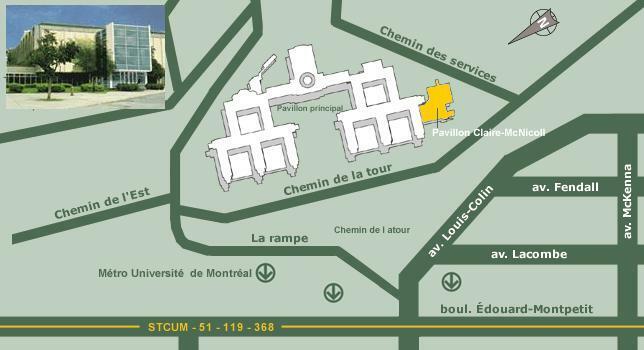 The workshop will take place at the Université de Montréal. The talks and panel will be held in room Z-330, pavillon Claire McNicoll. Lunch will be provided free of charge in salon Maurice L'Abbé, which is located on the sixth floor of pavillon André-Aisenstadt. En métro : Aller jusqu'à la station Université de Montréal. Une fois arrivé à cette station suivre les directives pour l’Université de Montréal (sur la gauche, après les tourniquets); à l’extérieur, faites trois pas à droite et entrez pour prendre la rampe mobile; en haut, sortez par la droite, puis par la gauche une fois arrivé en haut des escaliers, longez ensuite le pavillon Roger-Gaudry (pavillon principal) jusqu'à l’entrée principale du Pavillon Claire McNicoll. En voiture : Le Garage Louis-Colin se situe au coin de la rue Louis-Colin/Jean-Brillant et de la rue McKenna. Le coût du stationnement est de 8$ le samedi. L'accès au pavillon Claire McNicoll se fait ensuite par un couloir intérieur. Remarque : si vous rentrez par le coin Descelles/Queen Mary, continuez tout droit au premier croisement puis tournez à gauche 100 mètres plus loin. Depuis l'aéroport : prévoir 30-45 minutes par taxi (trajet Aéroport Pierre-Elliot Trudeau/Université de Montréal par Yahoo Maps (Beta)). Depuis la gare : prévoir 15-20 minutes par taxi et 30-40 minutes par métro (trajet Gare centrale/Université de Montréal par Yahoo Maps (Beta)). Depuis la station centrale d'autobus : prévoir 20 minutes par taxi et 30-35 minutes par métro (trajet Station centrale d'autobus/Université de Montréal par Yahoo Maps (Beta)). By subway: Take the subway until the station Université de Montréal. Once arrived, follow the indications to get to the Université de Montréal (on the left, after the ticket barriers); once outside, take three steps to the right and enter to take the moving belts; at the top, exit by the right, then go to the left once crossing the upstairs, cross-by the side of the Pavillon Roger-Gaudry (Main Building) until you arrive at the main entrance of the Pavillon Claire McNicoll. 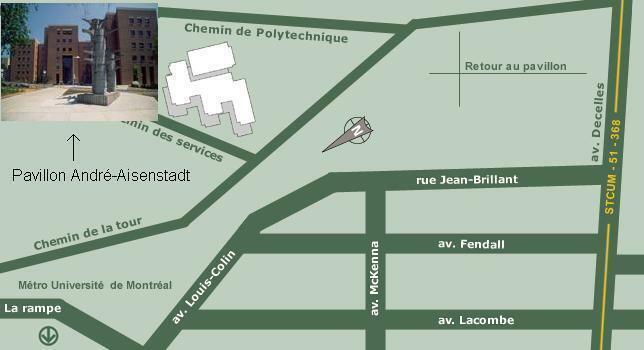 By car: The garage Louis-Colin is located on the corner of Louis-Colin/Jean-Brillant and of McKenna street. The parking fee is $8 on Saturdays. Afterwards, the access to Pavillon Claire McNicoll is done through an indoor corridor. Remark: If you arrive by Descelles/Queen Mary corner, go straight at the first crossing and then turn left after 100 meters. From the airport: It takes around 30-45 minutes by taxi (Airport Pierre-Elliot Trudeau/Université de Montréal with Yahoo Maps (Beta)). From the central railway station: It takes around 15-20 minutes by taxi and 30-40 minutes by subway (Central railway station/Université de Montréal with Yahoo Maps (Beta)). From the autobus main station: It takes around 20 minutes by taxi and 30-35 minutes by subway (Autobus main station/Université de Montréal with Yahoo Maps (Beta)). L'inscription est GRATUITE, cliquez simplement ici et remplissez le formulaire pour vous inscrire. Si vous préférez, vous pouvez aussi vous inscrire pour participer à l'atelier en envoyant un courriel directement à prive07@iro.umontreal.ca et en indiquant votre prénom, nom de famille, adresse électronique, affiliation et statut professionnel. Registration is FREE, simply click here and fill out the form. Alternatively, you may register to the workshop by sending an email directly to prive07@iro.umontreal.ca. Please specify your first name, last name, email address, affiliation and professional status.